Short version: how to estimate the parameters of a mixture of multivariate normal distributions (i.e. 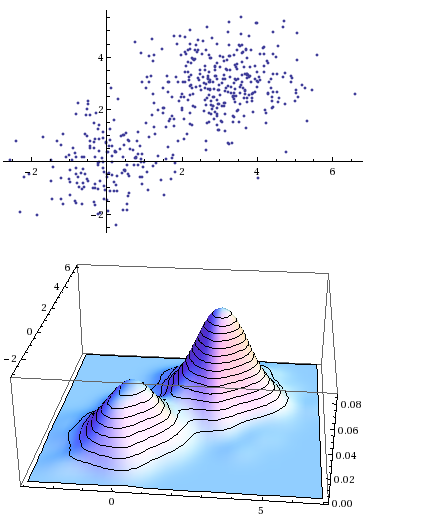 : Gaussian mixture model)? I am trying to estimate the parameters of a mixture of multivariate Gaussian distribution. All fine and dandy. However, the same approach does not work for me with mixture distributions. 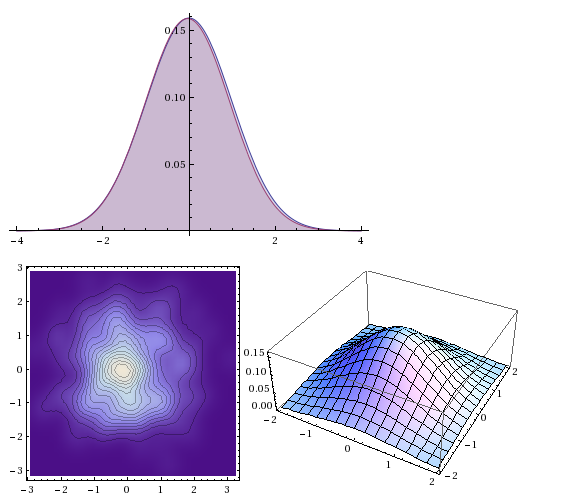 In particular, I am interested in mixtures of Gaussian distribution (Gaussian Mixture Model). For some reason, it works if, instead of using MultinormalDistribution I use BinormalDistribution with $\rho$=0. I know how to estimate these parameters using the Expectation Maximization algorithm, but I was wondering if there is a Mathematica-friendly way to do it. EstimatedDistribution seems to take much more time than what it would be reasonable (and, since the estimates are exact, "reasonable" means 0.1 sec). Mathematica by reporting it to Wolfram Research. 1) The mixture weights sum to one. 2) The covariance matrices of the two bivariate normals need to be positive definite. The second constraint can be enforced by using the Cholesky Decomposition of the covariance matrices as below. where c1 is a lower triangular matrix of unrestricted elements. The resulting covariance matrix is given by s1 below. Then one may get what you are looking for, depending upon starting values.. The first try here does not give the correct answer. You may have more success creating your own custom mixture distribution. that seems to lay out all the pieces required to create a distribution that one can use like the distributions that come with Mathematica. It takes some time and thought to set up all of the pieces, but once done your custom distribution can work like a charm. Not the answer you're looking for? Browse other questions tagged probability-or-statistics distributions or ask your own question. Slow mixture fitting when having ill-conditioned covariance matrices. How to make it faster? How to fit one distribution to another? Given an exact formula, how can Mathematica find a probability distribution whose PDF matches it?